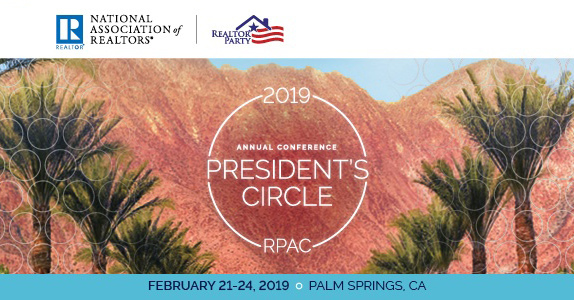 The 2019 RPAC President’s Circle Conference will be held February 21-24, 2019 at the La Quinta Resort & Club in Palm Springs, California. The program for the RPAC President’s Circle Conference is intended to provide President’s Circle investors with the opportunity to learn & discuss policy concerns affecting the REALTOR® community. Additionally, this conference translates into valuable networking opportunities and enables strategic partnerships for our members. All 2018 RPAC President’s Circle Investors & Platinum R Investors are invited to attend. Questions? Contact Patricia Tarhon at 202-383-1119.